Microsoft Excel 2016 Build 1708 Bug - Template Files Open Duplicate Workbooks - Event 1 Software, Inc. Attempting to open Liberty Reports or Office Connector Suite templates results in two duplicate workbooks being created from the template instead of one. An update to Microsoft Office 2016, released on September 12th, 2017, introduces a bug which results in this behavior for all Excel template files, not just Liberty Reports and Office Connector Suite templates. This update may be applied automatically depending on your update settings within Microsoft Office 2016. While this bug does not result in a catastrophic failure of report template functionality, it can be a nuisance to close the duplicate copy of your report template each time it is opened. Microsoft has issued a fix for this issue during it's cumulative update released October 16th, 2017. 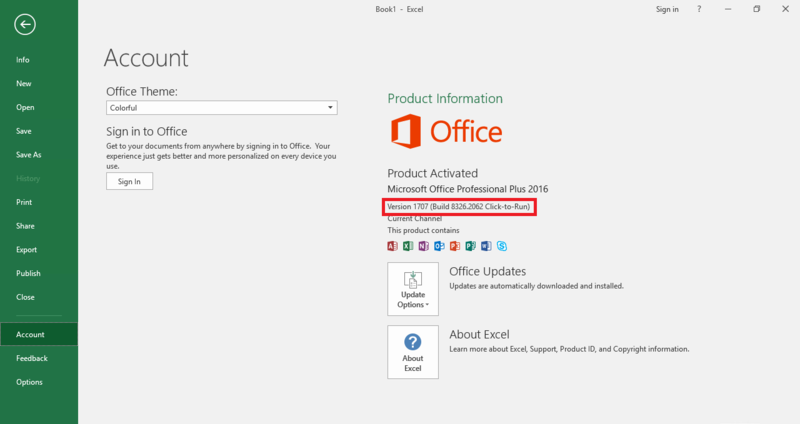 If you determine that your version of Microsoft Office 2016 has been updated to a version which falls within the range mentioned above, you can resolve the issue by updating your version of Microsoft Office 2016 to version 16.08528.2139 or higher.